Chicago, Sept 7, 2014, — UIUC Old Corns defeated Chicago Purple Warhead 3:0 in the final match of Mid-America Cup soccer tournament at Oak Brooks Central Park on Sunday afternoon. It’s the first time that a championship team having two woman players, according to organizer Mr. C.M. Lei of Mid America Chinese Recreation Organization (MACRO). UIUC Old Corns celebrates winning the Mid-America Cup(provided to bostonese.com by C.M. Lei). 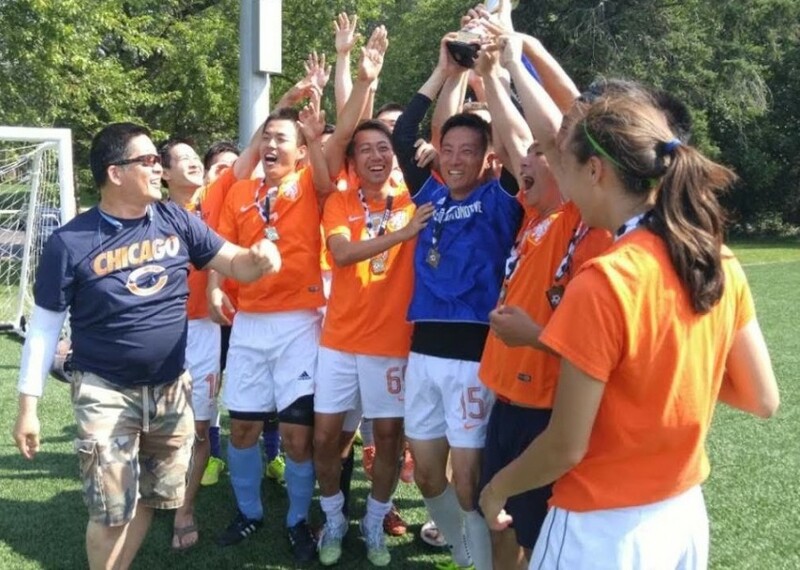 During Saturday’s group matches, UIUC Old Corns won all three games against Buffalo, New York Chinese Sports Association and University of Wisconsin Madison in Group B. The four-time defending champion MACRO was eliminated in Group A, along with the runner-up of last year’s tournament University of Wisconsin Madison. Jimmy Li, team manager of MACRO, said the rising competition level and losing key players to the Grand Tournament(GT) held at the same time in New Jersey were among the key factors that MACRO didn’t advance to the second day this year. He thanked player’s fighting spirit. “I hope next year MACRO can become champion of Mid-America Cup once again,” said Mr. Li. US Women’s National Team won the World Cup earlier this year. It’s great to see UIUC Old Corns winning the championship with two women players on the field. It requires great physical fitness to win the Mid-America Cup as the final two teams need to play five games in two days.